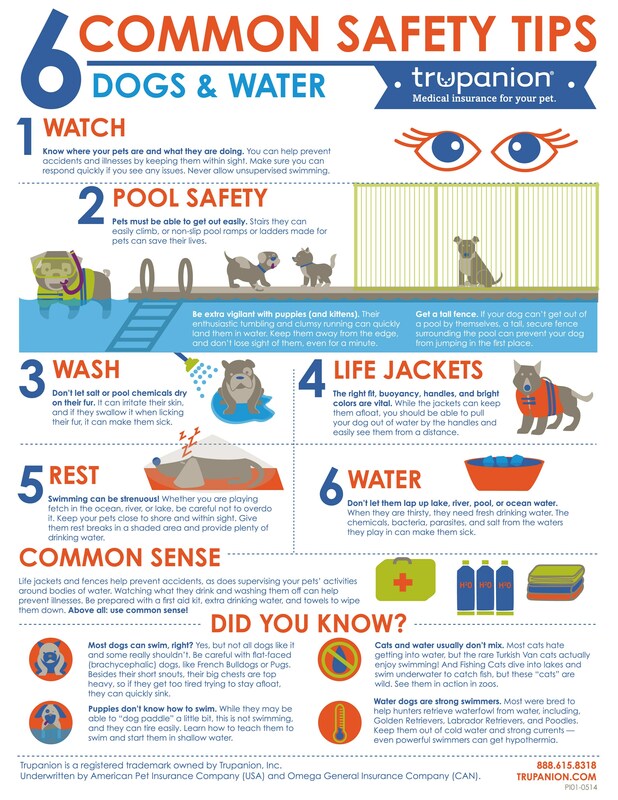 Today we’d like to share some pool safety tips when it comes to your dog in the form of a very handy infographic from Trupanion. Many dogs love water and on the whole they’re considered great swimmers. If you have a pool in your back yard you might occasionally let your dog join in the fun too. Pool chemicals can cause skin irritation and as we know dogs like to lick themselves a lot, can find their way into your dogs mouth which can make them sick. Try to wash your dog off/wipe them down as quickly as possible after they’ve been in the pool. Make sure your dog can get out of the pool quickly and easily if needed. They should have an easy exit route, via specialist pet ladders, non slip stairs etc. Pool water isn’t good for dogs! On a hot day, a lot of people will head for the pool to cool off, this might include your dog too, but don’t let them re-hydrate from the pool water. There’s lots of things not good for dogs such as pool chemicals, bacteria etc..
Let them take rests. Despite the fact that dogs are generally considered good swimmers, they can still get tired, especially puppies. Be aware that your dog might be getting warn out and may need a rest. Infographic credits go to Trupanion pet insurance.